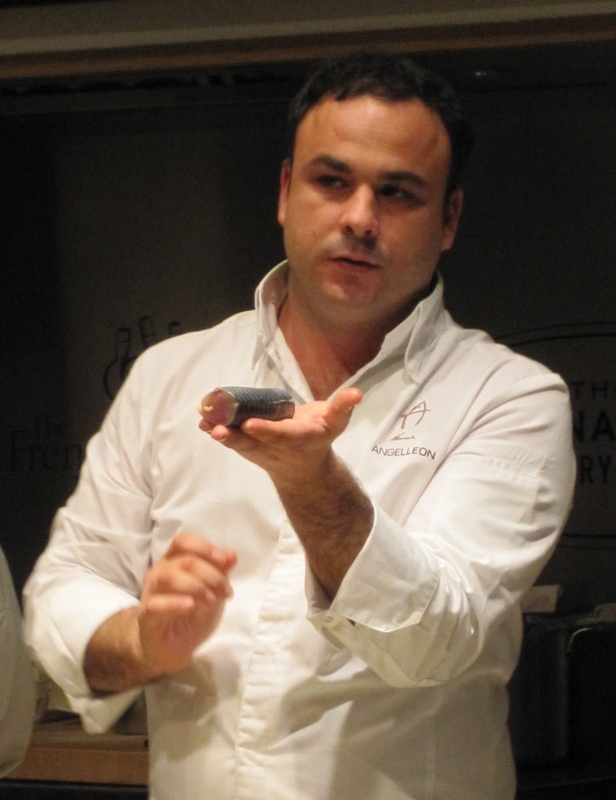 This afternoon, Blue Hill and the French Culinary Institute hosted a demonstration by chef Ángel León of Aponiente in El Puerto de Santa Maria, Andalucía, Spain, featuring his work with products from the ocean. León is the son of a fisherman and serves creative seafood preparation in his 25-seat fine dining restaurant, inspired by the great knowledge of the sea and its products that he gained going fishing with his father from an early age. 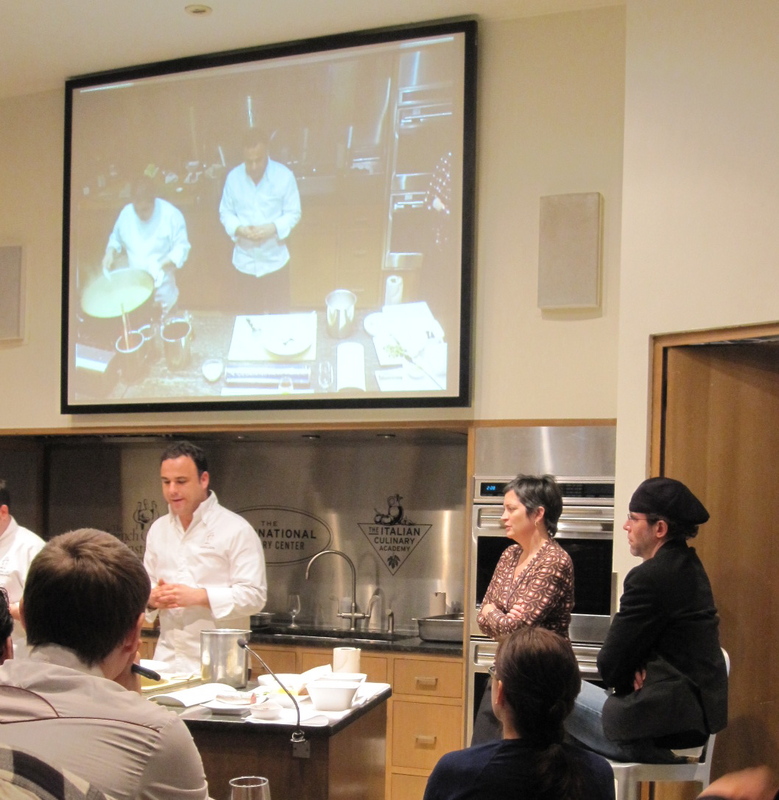 I haven’t attended many modern cooking demonstrations about fish and seafood, so being able to learn from such a master, who is also a clear, organized, and charismatic speaker, was a truly special treat. Chef León demonstrated three different techniques: olive pit charcoal fire, micro algae clarification, and cooking with plankton. He’s been working on those things for a while and has presented aspects of them before, but it was great to see it in person. 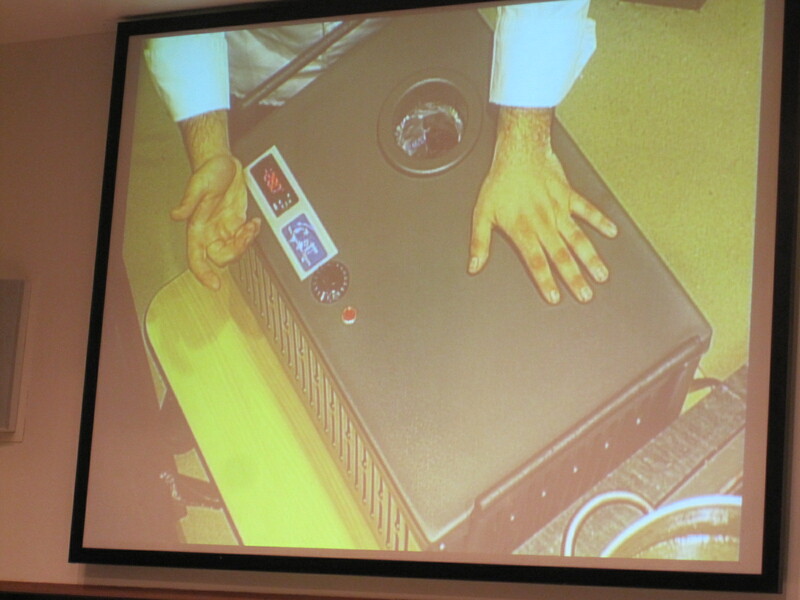 He also unveiled a machine that has not been presented in Spain yet. 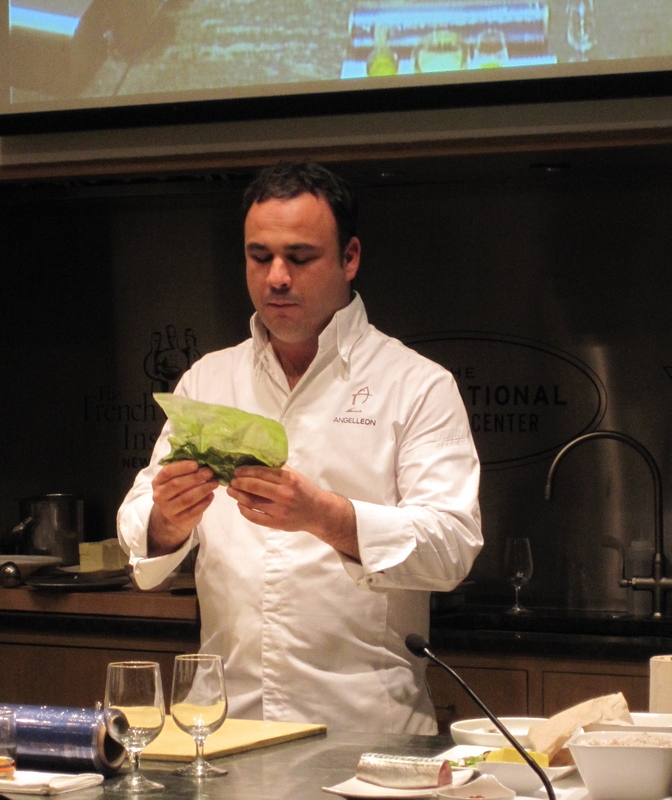 Throughout the demo, which was hosted by Chef Dan Barber, León made his commitment to sustainability (without using the term), responsible behavior, and preservation of cultural heritage very evident. After having spent a lot of time on fishing boats he was appalled that 80 percent of the fish caught in nets as byproduct was thrown back to the sea because customers want “glamorous, name fish.” He said that fishermen don’t have time to think about marketing names for the unknown fish. Seeing this made him want to make use of those 80 percent. Because of his relations with fishermen, they know to not toss back certain fish and bring them to him instead. He said that the chefs who work with such fish want control over the process and don’t want to buy it back from the market already fabricated. A lot of the fish are small and so hard to control once filleted, which prompts the need for other techniques. He takes primal cuts of those small fish, marinates them in salt to make them firmer, then wrap them in plastic wrap, which turns the fish into something that can be controlled. He plunges it 1 minute in boiling water then chills it on ice. The fat coagulates and allows him to then cut and serve the fish however he wants to. He used mackerel that way, for example, and said that with this method he can then serve it sashimi style, cook it a la plancha, etc. 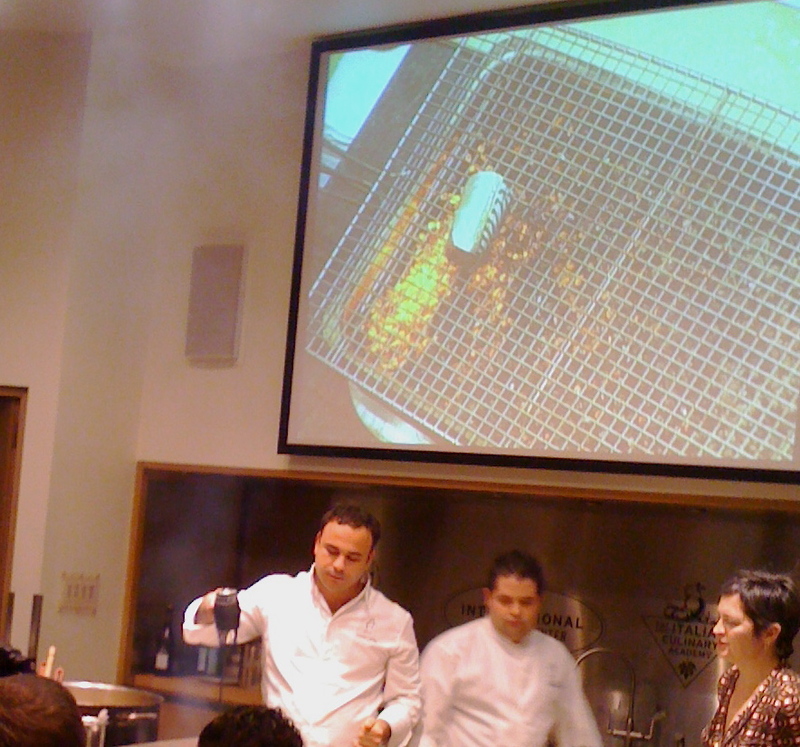 I missed the very beginning of his presentation because I was stuck in a meeting, so don’t know exactly how he started it, but he was cooking fish over an olive pit charcoal fire, which he was heating up with a blow dryer (he presented that with Chef Andoni Aduriz at Madrid Fusion in 2008). Olive pits are abundant in Spain and make for a clean burning charcoal. I think that the fish might have been the mackerel prepared in the process described above but can’t be absolutely sure. He gave the above explanation afterward, but the fish he was cooking when I arrived looked just like the one he then sliced to serve sashimi style. We didn’t get to taste the fish cooked over the olive pits, but he said that it picks up the flavor. He used the same fire again later in the demo and just restarted it with the blow dryer. Then he moved on to micro algae clarification, which he developed into the Clarimax machine. 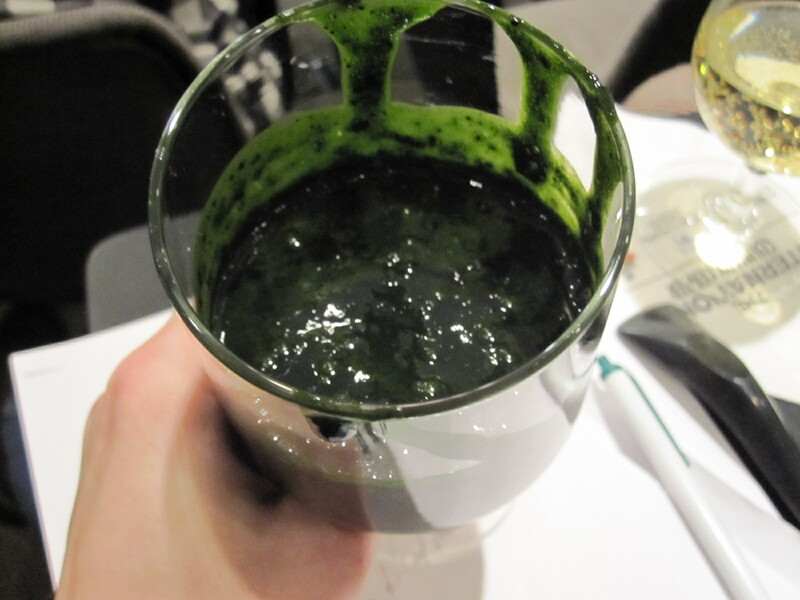 He wanted to work with algae and did his own chemical analysis of them in his kitchen. 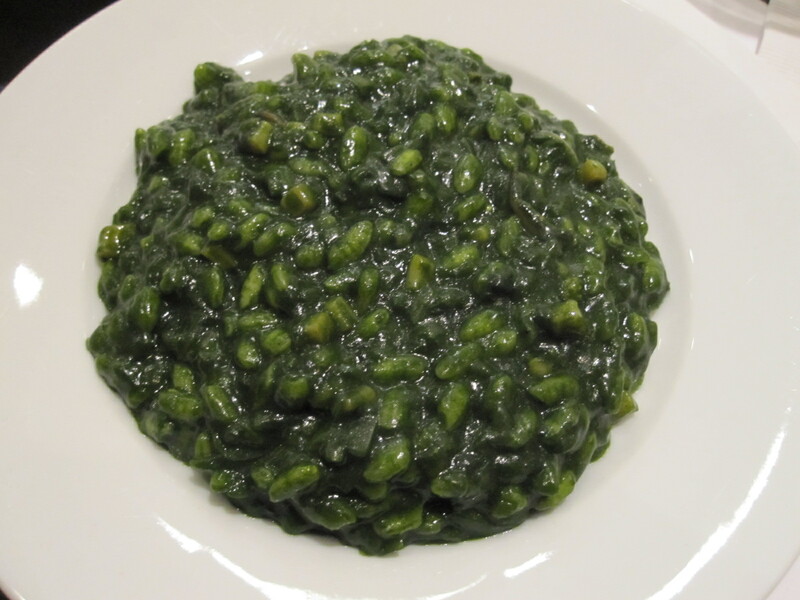 He then developed a flour-like product from those micro-algae. He made a very murky broth (which can be meat or fish) and added some of that flour to it. Then he passed it once through a chinois lined with thick, brown paper (the one very often available in kitchens and used to wipe hands and counters alike). The resulting broth is completely clear. That process doesn’t require any heat and no flavor is lost. He buys that micro algae powder from a purveyor but said that it was nearly impossible to obtain. Chef León then unveiled a machine that had been covered with a white cloth until then, something that he has been developing with a technology company in Andalucía for both home and restaurant use. He is very interested by “cold,” he said, and does work in that area, without using liquid nitrogen in the restaurant, however. Inside this machine is a liquid made of all-natural ingredients (he said we could eat it) that circulates and chills things very rapidly. The liquid is of course proprietary and he didn’t reveal any further details as to what it might contain. 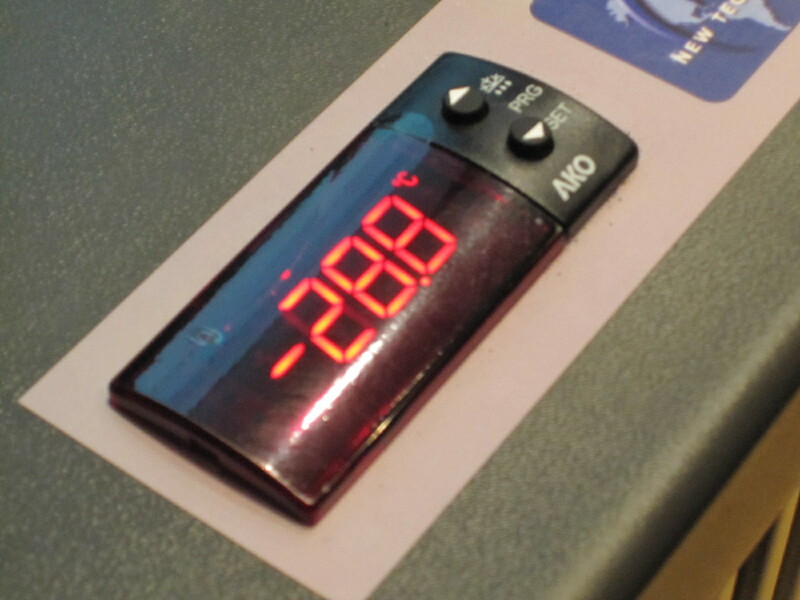 The machine doesn’t have a temperature dial, only a timer. 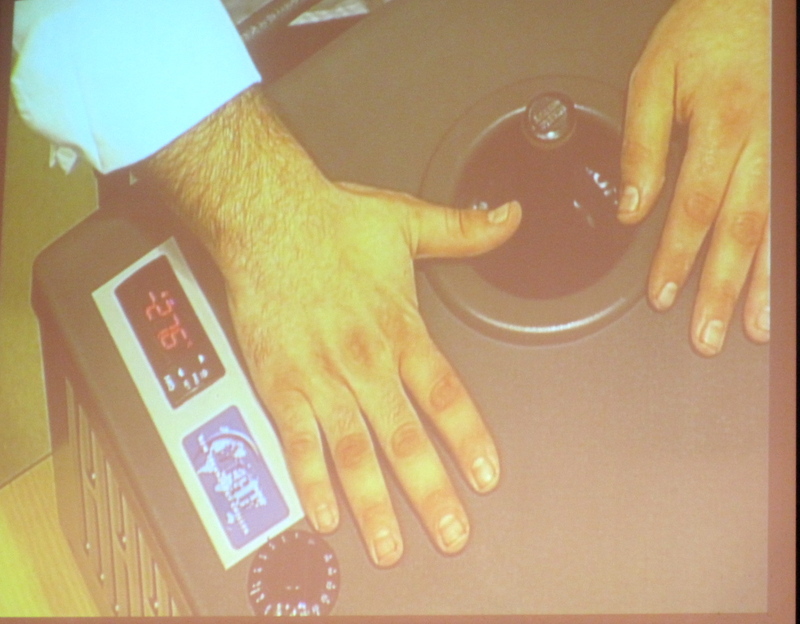 One controls the chilling process by deciding how long to leave something in the machine. Because his restaurant is small, they don’t have much storage space. Having this machine allows for white wine to be chilled a la minute rather than being kept in refrigerators, which is necessary in a region where temperatures average 40 C in the summer. 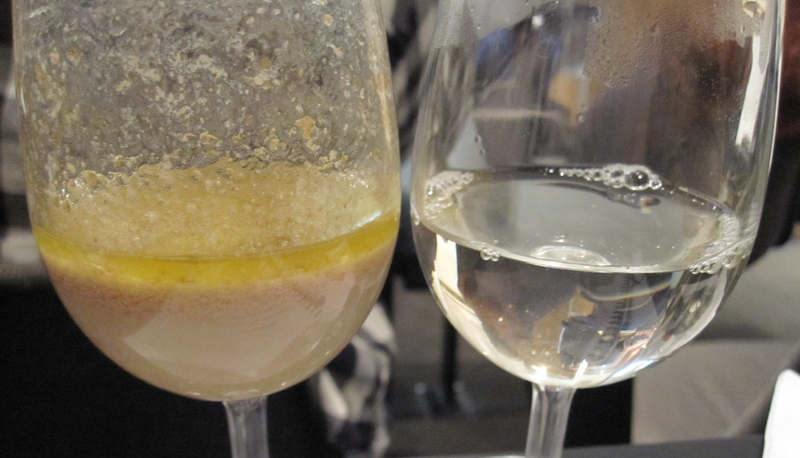 His sommelier also said that he didn’t like wines staying refrigerated for too long. With this, they can take a room-temperature bottle of wine to chilled in 2 minutes. 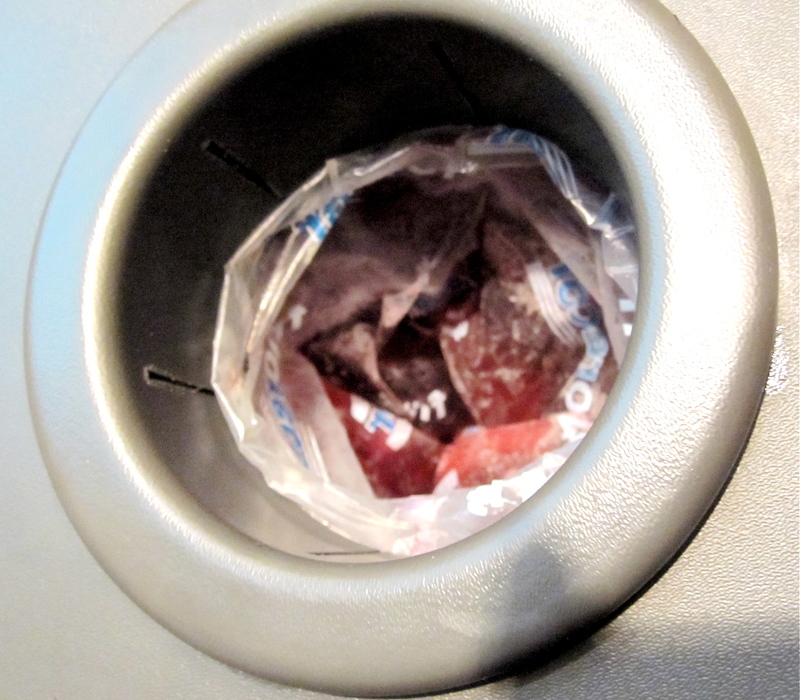 They can also instantly make a bottle of wine colder if a diner requests it. The machine he showed only had one hole, for one bottle at a time, but the one they use in the restaurant has four holes, which each have their own timer. It’s great for a tasting, the sommelier said. 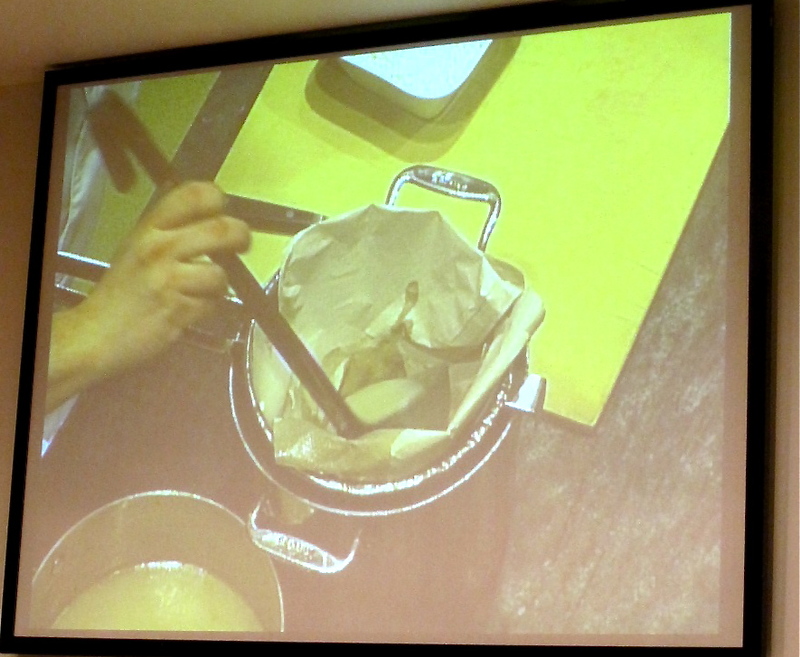 Chef León started using the liquid to chill stocks by dropping plastic bags of them directly into it. 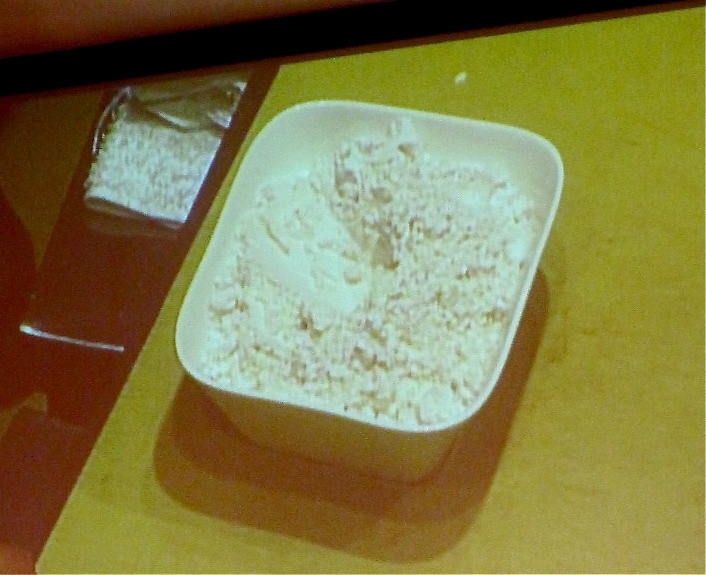 The machine can also be used with solids; he freezes an apple, for example, and then shaves it onto cheese. The demonstration concluded with a short video about a traditional way to fish tuna as they swim through the Strait of Gibraltar on their way to the Mediterranean Sea, where they spawn, from the Atlantic Ocean. Chef Barber spoke with great passion about this process, which goes back to Roman times. The fishermen use nets that let the fish best suited for spawning go through, which ensures that enough tuna reproduces. This is not the type of fishing that renders tuna an endangered species, Chef Barber insisted. Two hours had passed but I could have sat in that room for many more to continue absorbing knowledge and passion. I guess it’s time to plan a trip to Spain. Actually loved this article thanks.